SHANGHAI and BASEL, Switzerland, April 9, 2019 /PRNewswire/ -- WuXi Biologics ("WuXi Bio") (2269.HK), a leading global open-access biologics technology platform company offering end-to-end solutions for biologics discovery, development and manufacturing, and NBE-Therapeutics (NBE), a privately owned Swiss biotech company developing best-in-class, next-generation antibody-drug conjugate (ADC) products, announced a comprehensive development and manufacturing partnership for NBE's first ADC lead product NBE-002 (anti-ROR1). NBE-002 is a best-in-class immune-stimulatory ADC (iADC) treatment against the ROR1 cancer target and is planned to enter into clinical trials in mid 2020 in triple negative breast cancer and other indications. NBE-Therapeutics develops next-generation iADC products with the aim to improve the outcome for cancer patients, as it continues to develop iADCs based on its proprietary technology platforms. With its proprietary SMAC-TechnologyTM to generate site-specifically conjugated ADCs and its proprietary highly-potent anthracycline toxin platform, NBE has the ability to develop highly targeted treatments with long-lasting anti-tumor immunity. The partnership with WuXi Biologics will enable the supply of NBE's product for clinical trials under Investigational New Drug (IND) applications worldwide. With the establishment of state-of-the-art integrated biologics solution center, WuXi Biologics provides comprehensive one-stop service to global partners for antibodies, ADC drug substances and drug products. 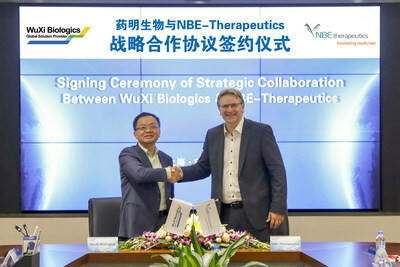 Dr. Ulf Grawunder, CEO of NBE-Therapeutics commented, "We are excited about our partnership with WuXi Biologics, which we consider one of the world-leading CDMOs for manufacturing of biologic therapeutics. WuXi Biologics will be a strong partner for our next step in the development of our highly promising cancer treatments with long-lasting anti-tumor immunity. This collaboration will accelerate the transition of our preclinical iADC development programs to clinical validation. We look forward to working with WuXi Biologics over the coming years to deliver improved treatment options for global cancer patients." "We are glad that NBE-Therapeutics with one of the best ADC platforms in the industry selected WuXi Biologics as their long-term partner for its first highly promising anti-ROR1 ADC program. It is another testament to the premier quality and global excellence of our integrated services, which continue to drive rapid expansion of our market share in Europe. We are excited in working with 7 companies on over 10 programs in Switzerland alone," said Dr. Chris Chen, CEO of WuXi Biologics. "Through our global quality, world-class technical capabilities and unparalleled capacity, we aim to empower any global partners to discover, develop and manufacture any biologics to benefit patients worldwide." NBE-Therapeutics is a biotech company, founded in 2012 with the vision to develop next-generation ADC products. The products will be advanced to clinical proof of concept with the goal of improving treatment options for cancer patients. The company leverages proprietary platforms covering all aspects of ADC development: its patented Transpo-mAb DisplayTM technology for antibody discovery, its patented SMAC-TechnologyTM for site-specific payload conjugation of toxins to antibodies and its patented novel highly potent anthracycline-based toxin platform. The company is financially backed by the Boehringer Ingelheim Venture Fund, the PPF Capital Partners Fund, Novo Holdings and additional private investors. For more information about the company visit the website www.nbe-therapeutics.com.